This sketch is so easy, it's like cheating. 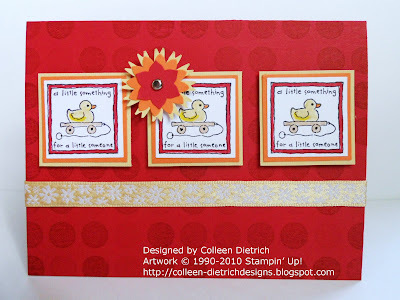 It works perfectly with stamps that are square shaped and small, like the Stampin' Up! retired set Love Notes. I needed some more baby cards to add to my stash, but didn't want to spend a lot of time on them...so I made two of these in under an hour (that's speed-stamping in my book). Yes, only one challenge for me today. Well, at least for this post! Lookin' good, Colleen!! I love the bright red. What a refreshing change from pastel baby cards. That ducky is adorable! Can't wait to see your latest inspiration project!! This is so pretty in these warm colors! Love the little duck pull toy. 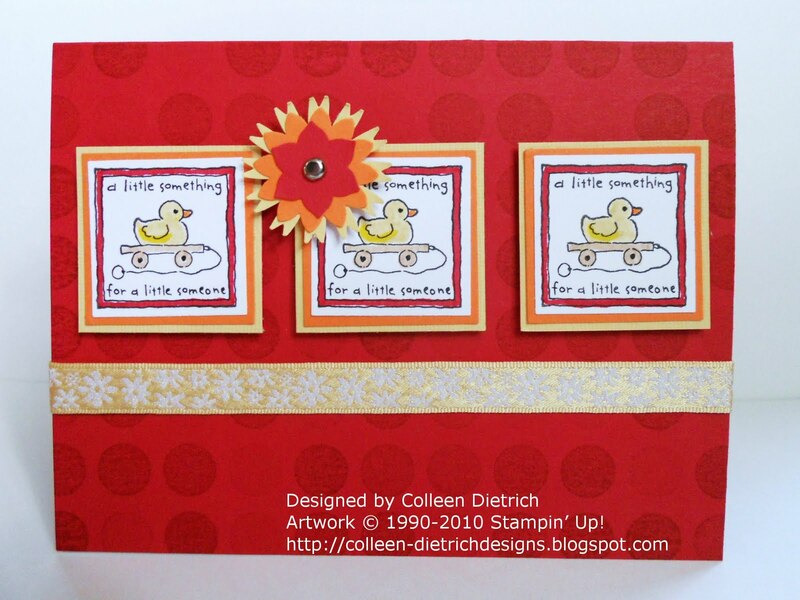 Colleen, this is adorable and I love it in these warm colors. Thanks for joining in on Speedy's Challenge this week. Good luck in the drawing!! What a cute baby card! thanks for playing with Speedy again! Very cute~ Thanks for playing with Speedy's Friends a second time! Thanks for playing with Speedy Cat's Friends! Such a classy layout!